Central District Court sentences Abu Aram from Hevron to 22 years in prison for stabbing Niv Nechemiah in Yavneh supermarket in August 2017. 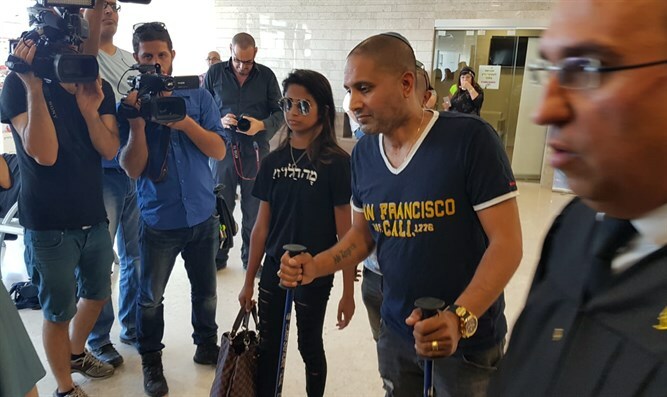 The Central District Court in Lod today sentenced the Arab terrorist who critically wounded Niv Nehemia at a supermarket in Yavne about a year ago to 22 years in prison. The terrorist, 19-year-old Ismail Abu Aram, from the town of Yatta near Hevron, was convicted of attempted murder in terror-connected circumstances. The terrorist will pay Nechemiah compensation in the amount of NIS 200,000 ($55,000). According to the indictment, Abu Aram intensified his Islamic observance and was inspired and encouraged to observe the Muslim teaching to commit "Jihad against the Jewish-Israeli occupation". As part of his Islamic buttressing, the terrorist "Omara" spent some 12 days in Saudi Arabia during the last month of Ramadan. To carry out his ideal of Jihad in practice, Abu Aram decided to stab an Israeli Jew to death within the territory of the State of Israel. To carry out the act, on August 2, 2017 Abu Aram left his home to enter Israeli territory without a legal permit. He decided to carry out his plot against a man known to him as his former employer, using a knife he would acquire and a canister of pepper gas he brought with him. The terrorist arrived by public transport to Yavneh. Failing to locate his former employer, he decided to carry out the attack on another victim, using a knife he would steal from the nearby supermarket. To this end, he entered the supermarket, came to the aisle where knives were on display, took a knife with a 15 cm long blade, and slipped it in his pants. He then started to stalk a Jewish victim. As he wandered through the supermarket, the terrorist identified the supermarket branch's deputy manager, Niv Nechemiah, arranging products in an aisle. The terrorist drew the knife from his pants and charged Nechemiah, stabbing him in the neck, chest, stomach, and head a total of fifteen times. In response, and despite his severe injuries, Nechemiah fought the terrorist, hurling at him every object he found nearby. During the struggle, the knife broke and dropped from the terrorist's hands. At this point, the attacker took out the pepper gas canister and when he saw Nechemiah fleeing from him, sprayed Nechemiah's face with the gas and ran out of supermarket. Nechemiah suffered severe injuries and was hospitalized in Kaplan Hospital in Rehovot. Following Nechemiah's cries, the ensuing commotion, and those present shouting "terrorist" while chasing Abu Aram, a number of bystanders pursued him and after a short chase managed to catch and hold the terrorist until police arrived.